The young MC shares a visual for his recent collaboration with Killer Mike. In his new video, Daye Jack never looks at the camera: whenever you see him, he's rapping in profile, face mostly covered by a hood and a baseball hat, mist rising from his breath in the dark air. These shots are interspersed with video footage from a string of recent, high-profile examples of racially-motivated police violence and the protests that followed them. 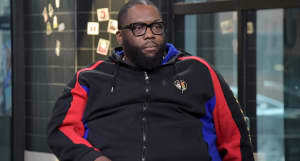 Killer Mike is the track's featured guest, and Jack cleverly pipes him into the video with clips from his various public engagements, including the speech he gave after a grand jury decided not to indict Darren Wilson. Watch the David Gallardo-directed visual above.